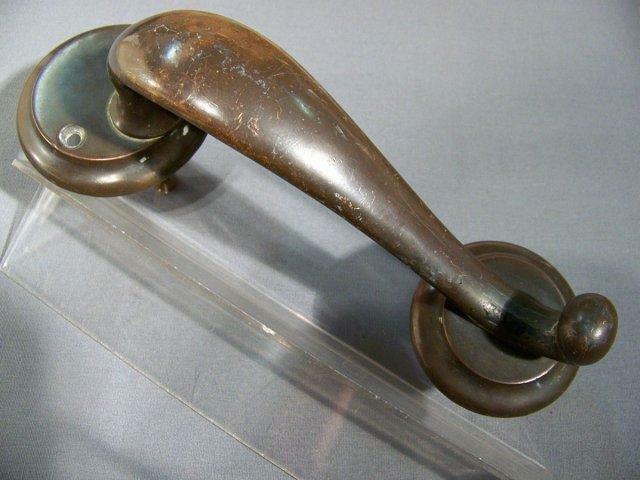 Price Is For This Old, Solid Brass Pull Handle, That Has Nice Dark Patina; [displays more of an overall dark, even tone, than photo indicates]. Has Some Old Minimal Wear. Appx. 9 9/16" Overall Length Of End Of One Plate To End Of The Other Plate; [appx. 3 1/8" large backplate diameter and appx. 2 5/8" small backplate diameter; appx. 6" between mounting screw hole centers]. Has 2 Tiny Tabs In Back Of Larger Rosette, That Recess Into Wood. Mounts By 2 Screw Bolts Into Back And 2 Screws Into Front Of Larger Backplate. 1 Pull Available. Purchaser Pays Shipping.